After graduating from the University of Bristol in 2011, Liz decided to take a less than conventional route and took her first job as a vet in Hong Kong. She had a fantastic couple of years gaining experience in small animal practice, while travelling around South East Asia in her time off. 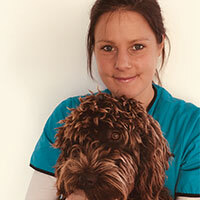 In 2013, she decided it was time to return to the UK and has since worked in small animal practice in and around Bristol. She has recently moved to Monmouth and is looking forward to working in the Forest, a bit closer to home. Liz enjoys the variety of being a GP and has developed an interest in dermatology. In her spare time, Liz doesn’t like to sit still. She can usually be found cycling or running in the forest with her trail dog, a spaniel poodle cross called Kemey.